The Elektra™ Access allows you to tackle rolling and uneven terrain all winter long. Allowing you to maximize your natural gait on rolling and uneven terrain, the Access and Elektra™ Access deliver comfort and confidence to its wearer, thanks to a heel-lift bar, Wrapp™ Trail binding, and Light-Ride™ Suspension. Comfortable and easy-to-use, the Wrapp™ Trail men's and women's bindings are easy to enter and exit while cradling the foot securely. 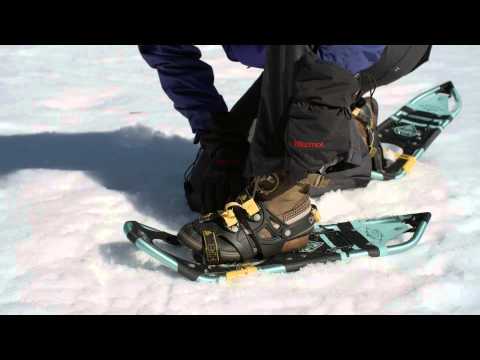 Sure footing on two planes, the Twin-Trac™ toe crampon uses a sturdy row of front points and two side teeth to keep your foot from twisting. Our surest grip comes from sharp ice tips on the heel cleat with four angled, ridged side rails for superior all-mountain traction. The integrated heel lift bar ties directly into the traction for deeper penetration with each step. Light-Ride Suspension (LRS) is the perfect blend of comfort and function, allowing your foot to articulate naturally and cushioning impact for smooth striding on mellower terrain.